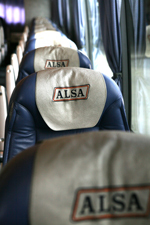 In contrast to many other European countries, Spain has a comprehensive national network of coach services. So you can get just about anywhere in Spain by coach and bus, and twice as many Spaniards travel this way as by train. This is because coach travel is not only generally cheaper than the train, it is usually also quicker, particularly on medium-distance trips. Getting a seat is not normally a problem, and for local journeys (e.g. Madrid to Valladolid) you can just turn up and buy your ticket for the next service. However, for longer distance trips and especially popular routes in peak season (e.g. Madrid to the costas) it is advisable to book at least a day or two in advance. Return tickets represent better value than two singles. Also, If you are buying long-distance tickets in advance, or by internet, remember to have your passport handy as some operators ask to see proof of ID before allowing you to board. Don’t think that taking the coach has to mean compromising on comfort. In Spain, the major operators offer modern and comfortable vehicles. This includes coaches that travel non-stop to their final destination, coaches with leather seats, and of course lots of extra leg room. Some coaches even offer on-board catering with hostess service included in the ticket price. As there is more than one coach station in large cities, it’s important to find out from which station your coach leaves. You can save time by going direct to www.movelia.es which has information on most of the big operators in Spanish, English and German.